Now what is this? A smoked beer?? It really isn’t as crazy as it sounds. 250 years ago virtually all beers were smoked (it’s true, Google it! ), but with the dawning of the industrial revolution most of the smoke lifted. However, in the German town of Bamberg the flame has quite literally been kept alive and to this day the town’s brewers produce world renowned beers brewed with their own special rauchmalz (beechwood smoked malt). We’ve taken our best porter recipe and added a good measure of that same Bamberg Rauchmalz. The smoke mingles beautifully with the rich, dark roasted chocolate flavours of the porter without being overpowering. Although it pairs extremely well with smoked seafood, barbeques, strong cheeses and hearty stews, its food friendliness isn’t limited to savouries; chocolate and caramel based deserts are great companions too! Trust us; it really isn’t as crazy as it sounds. I really dislike all this food pairing blurb on beer bottles nowadays, especially when one states at the end '..or can be enjoyed on its own' What is that all about ? What if you are sitting in some crummy bar with the only food option of beer nuts or crisps..'no wait, they say it can be enjoyed on its own, thank gawd for that'. Stop this nonsense, please. Light wafts of roast malt, smoke/charred wood and chocolate. Big Smoke pours black with a thick creamy beige head. Mildly sweet intake with roasted malt, chocolate, a touch of licorice and light smoke while the malty finish is sharp and dry. Licorice, malt and coffee linger in the aftertaste. Lowly carbonated, this has a creamy mouthfeel. This reminded me a lot of the coisbo - brooklyn fall which i posted not so long ago as in the lightness of the smoke profile. Rightly or wrongly when I see 'smoked' my mind always wanders to Aecht Schlenkerla Rauchbier Urbock which for me is the ultimate smoked beer. In other words I like my smoked beer intense. Otherwise, this is a decent enough porter which I had no problem with. I would drink it again if the opportunity came up but I would not rush out to buy another. 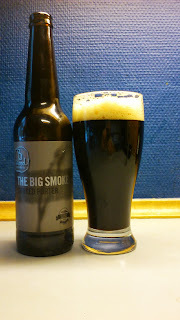 Summing up, like the mentioned coisbo, this is another decent gateway for someone wanting to try a lightly smoked beer. This scored 7/10 on the 'Please Sir, can I have more smoke' Beerometer.